As we go to press, it would seem that rumours of another white Christmas have been greatly exaggerated… but let’s ignore that for now, because the weather could yet change and snow lovers could still get their Christmas wish! However, even if the white stuff doesn’t arrive in time to add an extra special touch to the big day, there are still plenty of ways to ensure you are full of the festive spirit – especially in our local area, where businesses and communities are pulling out all the stops for a cracking Christmas. 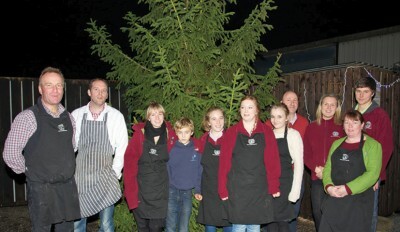 We’ve already heard about Woods Farm and Reeves Trees stepping in to save Christmas in Alvechurch, where the lights are now twinkling prettily, and Barnt Green will soon follow suit with its switch-on on December 5, with the lights having been installed by local business GJH Electrical. If you haven’t yet organised your own display, why not pay a visit to one of our friendly garden centres to collect your tree? Hopwood Garden Centre has some great specimens to choose from, while Fresh@Burcot and Littleheath offer not only real and artificial trees but also a vast array of lights and decorations with which to create a sparkling centrepiece. Apart from the tree, one of the other key components of a perfect Christmas is the food and drink, and there are plenty of local businesses offering everything you need for a festive feast. Coopers Farm Shop got the season off to a great start with an Open Day featuring tastings, special offers and mulled wine, and is now taking orders for Christmas fare, hampers and seasonal vegetables – all sourced from the local area including Coopers Farm itself. And in Alvechurch, The Village Green Grocers and EJ Crow & Son butchers are also offering fresh local produce (read more about them on Page 39). Meanwhile, popular wine and spirits specialist Noble Rot has relocated to Willowbrook Garden Centre in Catshill, offering a huge selection of wines, whiskies and ports and the expert advice to help you choose the right one. Ideal for a gift or to stock up for those Yuletide parties. Also on hand to supply the drink is Weatheroak Ales, the local real ale off-licence in Alvechurch – the beer can be supplied in bulk for Christmas or New Year parties and you can call in to purchase the ales in containers from one up to 72 pints… a great present for a beer lover! On the subject of gifts, there are so many options that it can be difficult to choose, especially for those people who already seem to have everything. For an unusual present idea, how about giving guitar lessons? Guitar Tuition is available in the Barnt Green area, for electric and bass guitar, teaching all styles from rock and indie through to blues. CDs are also available for practising at home. For a more traditional gift, jewellery is always appreciated, whether the recipient prefers precious metals or vintage style. RF Collyer in Rubery offers a wide selection of gold and silver jewellery as well as watches and giftware, while Coconut Pink specialises in fashion jewellery in a rainbow of colours with vintage and new beads and charms – commissions can also be taken for an extra-personal touch. If you are lucky enough to receive a brand new Apple iPad in your stocking this year or you’re giving one as a gift, but you’re not quite sure how to maximise its potential, help is at hand from i-Pad Consultancy by Steve Creron – it’s like having your own Apple genius bar! Finally, don’t forget that you can meet one of Santa’s real reindeer (and her baby) on Saturday December 3 at Fresh@Burcot Garden Centre – ring them for further details! Merry Christmas from everyone at The Village!